A miniature oil portrait of 70's comedy icon Harvey Korman. A miniature oil portrait of Kentucky Derby and Preakness winner Big Brown. A miniature oil portrait of Blessed Mother Teresa of Calcutta, smiling. A pencil portrait of Blessed Mother Teresa of Calcutta. An original miniature pre-memorial oil portrait of British pop star and soul singer Amy Winehouse, who recently recorded the theme song for the upcoming James Bond film Quantum of Solace. The question is-will Mrs. Winehouse live long enough to hear her big and brassy Shirley Bassey-styled megahit played on the radio? I normally hold off until a person has passed away before painting a memorial portrait, but since Mrs. Winehouse seems intent upon killing herself there seem to be no point in waiting. Amy; I dare you to prove this portrait wrong. In this recent 'Amy Winemouse' video, Amy displays a brood of baby mice and in the heartbreaking voice of one implores her jailed husband Blake (who has returned to his Catholic faith while awaiting trial) not to divorce her. A Barack Obama cartoon; actually, my most recent commissioned political 'muppet' miniature oil painting. The size of this piece is 4 by 6 inches, painted on canvas. A painting similar to this or of any other subject is $50 plus 3 for the shipping; payments can be made through Paypal or by check or moneyorder via snailmail. Click above or here for larger Divided We Fail cartoon. Big Fail. Click above or here for larger Burma cyclone / China earthquake cartoon. Faith and Timothy have something to say about the recent Burma cyclone and China earthquake twin devastation. Click above or here for larger Starbucks is now Slutbucks cartoon. Super sized sea whore coffee image. A Christian group called 'The Resistance' is leading a protest against the new 'retro' Starbucks logo, which features their original 1971 spread-eagle two-tailed logo. Starbucks will obviously stoop to anything now to bolster flagging coffee sales. Thanks to Starbucks Coffee Talk (thedripp.blogspot.com) for posting today's cartoon. Click above or here for larger Vatican UFO cartoon. Inspired by the recent statement by the director of the Vatican Observatory that alien life forms may be considered our extraterrestrial brothers but may not need redemption, among other observations. This is also a cartoon about the dangers of not giving a full and complete confession. A drawing of Father Robert Altier, formerly of St. Agnes Catholic Church in St. Paul, Minnesota, and creator of The Fundamentals Of Catholicism series. The drawing was done from a photo, which shows Father Altier preaching at St. Agnes. I expect our former coadjutor and new Bishop John Nienstedt is waiting until after former Archbishop Harry Flynn, who retired last week, completes the remaining appointments on his official calendar before fully restoring Father Altier to the equivalent or better of his former duties. I expect that is what he will do. Not a few of us also expect that's what he should. Standing less than 5 feet tall, Polish Catholic social worker Irena Sendler saved more than twice as many Jews during World War II than Oskar Schindler, many times sedating children and carrying them out of the Warsaw Ghetto in sacks, boxes or coffins in order to save them from a trip to an extermination camp. Eventually she was caught, tortured, but survived the war. Her story was largely unsung until 1999 when four Kansas girls doing research for a school play discovered she was still alive. In 2003, Pope John Paul II sent a personal letter to Sendler, praising her wartime efforts. Irena Sendler was passed over for a Nobel Prize in 2007. The award instead went to Al Gore. A miniature oil portrait of Gospel legend Dottie Rambo, who died in a tour bus accident last Sunday morning on her way to a Mother's Day engagement. I've always been a fan of Dottie's, both because she was so prolific and also because she forged ahead by faith through personal hardships, which included the breakup of her family and partial paralysis. God bless her friends and family. A pencil drawing of Pope John Paul II, drawn from the same photo as that of an earlier sketch. I have a second and this time much more impressionistic painting of Kentucky Derby filly Eight Belles for auction on Ebay as well; a subject I decided to revisit after receiving emails accusing me of exploiting a horse. Peta poster horse Eight Belles. A miniature memorial oil painting of Dungeons and Dragons creator Gary Gygax, who passed away in March. Not the best scan; I'll photograph this under natural light later on Sunday and post a better pic. A miniature oil painting of Democratic Presidential candidate Hillary Clinton in the style of a Sesame Street muppet. Hillary is pictured here as Ms. Piggy, drinking whiskey in a bar with a rifle displayed proudly on the wall behind her head, and wearing her famous Rhode Island campaign stop yellow and black designer dress, which made her look either like a large bee or a school bus. Thanks for the mention on the Tough Pigs Muppet Fan Forum. A miniature oil painting of steampunk Russian Prime Minister Vladimir Putin. My timing seems to be right for this painting, as Russia has revived its grand military parade spectaculars of glories past. Considering their sales of armaments to any and all buyers, I'm surprised they don't have little price tags fluttering off of every turrent. 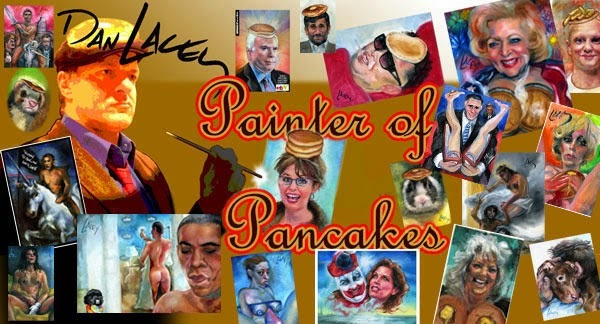 Vladimir 'steampunk' Putin art portrait gets noticed by the Russians in this Inosmi forum. A miniature oil painting of the San Diego, California harbor seal pup who was entrapped by both a fishing net and the law. A cartoon on the subject of the devastating Myanmar (Burma) cyclone, and the fact that what aid is now being allowed to arrive by the military government is too little, too late. A miniature oil painting of Hillary Clinton and Bill O'Reilly as muppets Ms. Piggy and Kermit the Frog. Inspired by the recent Fox News interview. As you can see, they are getting along fabulously. The most recent painting in my 'political muppets' series. I've set a minimum price of $10 for this item, but you can purchase it immediately for $25 using that Paypal option. A miniature oil painting of Beauty, the rescued Alaskan bald eagle who will soon receive an artificial beak to replace the one damaged by a shotgun blast. GayBear Admits He Watches FoxNews...You Can Too! Amusing how many blog commentators report in detail on Fox News, but won't admit to being regular viewers. A miniature oil painting of filly racehorse Eight Belles, who placed second in the Kentucky Derby and who had to be euthanized moments later after breaking both front ankles. You still have a few hours left to bid on this minature oil painting I created last week, inspired by the beloved Zombie Kid 'I like turtles!' video. Keith Richards has admitted that he did indeed snort his late father's cremated ashes after all. A miniature oil painting of former Russian Federation President and current Prime Minister Vladimir Putin. A portrait of television personality Oprah Winfrey. Present it to Oprah herself on your next visit to the windy city. and perhaps she will thank you with a car in the shape of Barack Obama. A portrait of Democratic Presidential candidate Barack Obama, explaining something or other regarding the Reverend Jeremiah Wright. A portrait of the Dalai Lama, praying that China will leave Tibet alone. An oil painting of a cat with a mustache and a glass of wine, and in a very romantic mood. Would make a fabulous engagement present. Suave cat would like to marry you.